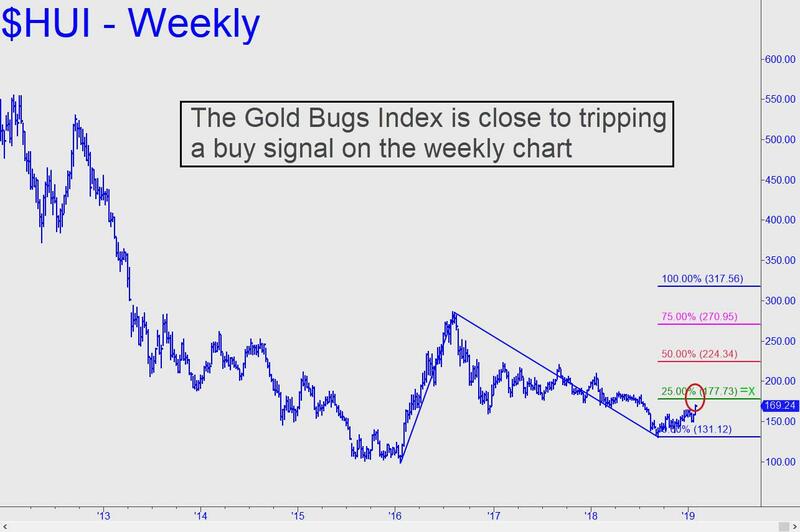 HUI, the Gold Bugs Index, is close to triggering its first buy signal on the weekly chart in more than two years. The first proved to be a dud, and it sent this popular trading vehicle into a ratcheting downtrend that would have driven most bulls to the edge of despair. As a result, skepticism toward the current rally undoubtedly is high. But traders should be prepared for a pleasant surprise if it touches 177.73, where the buy signal would occur (see inset). At that point we would raise our sights to a 224.34 ‘midpoint Hidden Pivot’ as a minimum upside objective. It is associated with a target at — better sit down for this — 317.56 that presumably would usher in a new era for the mining industry. Can you picture a geologist as Time magazine’s Person of the Year? Outside of the world of gold bugs, these companies have gotten precious little respect or attention since bullion topped more than seven years ago. That could be about to change. If you want a closer look at Rick’s Picks, click here to sign up at the top of the home page for a free two-week trial subscription -- no credit card needed. Drop by the 24/7 chat room first — and be sure to say hello when you arrive!